Saint John's is considered one of the top teams in Division 1 this season. We'll get a preview of that in this race when Pioneers invade the Gardner Municipal Golf Course for Saturday's meet. St. John's team consist of three sub 16-minute 5K guys - Joshua Rahn, Patrick Craemer and Joe Walsh. It's not too far-fetched to think that this talented trio could go 1-2-3 this weekend. The three teammates have done it before this season when Rahn led Craemer and Walsh across the line in the Class C race of the Bay State Invitational on Oct. 14. 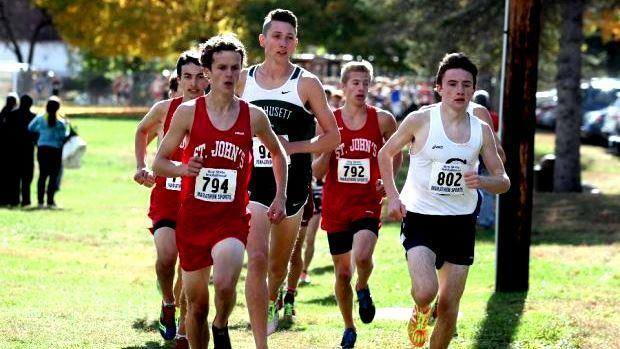 The Pioneers' Domenic Mastromatteo, Tyler Griffin, Thomas Goodhue and Ben Morris have all gone sub 17 this fall, making Saint John's a heavy favorite at the divisionals and certainly a lead contender at next week's All State Finals. Individually, Marlborough's Brian Oram, Shrewsbury's Andrew Kaye, Wachusett;s Isaac Steele and Anders Narita and Shepherd Hill's Brian Belmonte are just a few runners that could also figure in those top 10-15 placements.